Umbrella species: Umbrella is divided into two categories. Straight umbrella and Folding Umbrella. commonly known with diameter up to 30 "above called golf umbrella, golf umbrella handle is usually a straight body shape rather than curved shape, because of the convenience of golf player inserted in the golf bag. In folding umbrella, there are 2-fold,3-fold, 4-fold, 5-fold style, 3 folded umbrella is the most common, and 5 folded is the shortest. 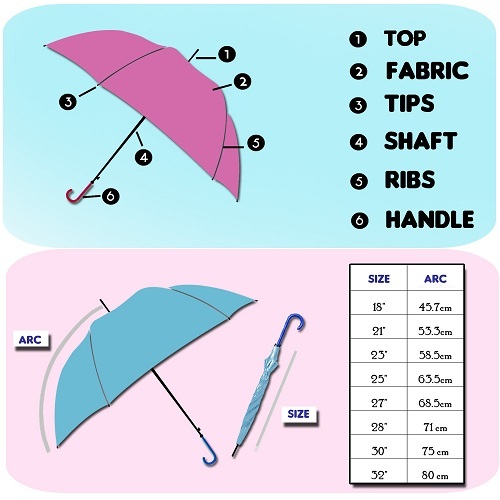 Umbrella components: Umbrella top/cap, the umbrella fabric, umbrella ribs, Umbrella runner, umbrella tips, umbrella shafts, and handle. Umbrella top/cap: The umbrella point to the sky when in used, straight umbrella called Top, folding umbrella called Cap. Mainly composed of plastic, iron, aluminum or wood into. Usually iron, aluminum or wood umbrella tail fused with shaft, plastic umbrella tail assembly in the shaft. Umbrella Fabric:in the umbrella industry, there are varieties of umbrella cloth materials, but the most common three called Pongee, Polyester and Lylon. Umbrella Fabric:the umbrella structure is supported an umbrella with the bones up to 6-24 ribs. Can always choose Metal, Aluminium & Fiberglass. The price of metal is relatively cheap, but it is less flexibility, and easily to bend. Aluminium is lighter, but not suitable for all umbrellas. Fiberglass is more expensive, but its full of strong elastic and difficult to break. Umbrella runner: umbrella runner is divided into two parts, called Upper runner & lower runner, it used to support all the ribs together. Umbrella Tip:It used to stabilize with the umbrella ribs & the umbrella cloth. The main material is a plastic or metal, shape variety to choose. Umbrella Shaft:Shaft is used to connect and support all points of the umbrella, Common three kinds of materials to choose from Metal, Aluminum, and Fibreglass. The price of metal is relatively cheaper, but it is heavy. The aluminum is a lighter, higher-priced. Fibreglass is light, hard, suitable for use in the size of 27” or above like golf umbrella, and the price is the highest. Umbrella Handle:Handles is used for user to hold up the umbrella parts. There are varities of shapes & customised colors. Most commonly is J shape handle for straight umbrella and straight handle for golf umbrella. Also there are five kinds of the most commonly used material of the handle: plastic, wood, rubber, EVA and aluminum.